If you are looking for information on the Play N Trade franchise business opportunity, Play N Trade Video Games franchises or Play and Trade franchising, then you have come to the right place. "The only game in town!" If you have been looking for an opportunity in a fast-growing industry that is one of the most exciting, unique and profitable in the world, you have come to the right place! We are talking about the video game industry and best opportunity within that industry - Play N Trade. Our growing global footprint has earned us the recognition as the largest and fastest growing video game franchise in the country. 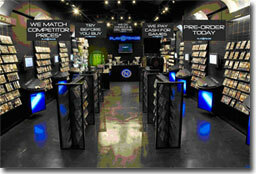 As of March 1, 2007, we have sold the rights to open over 220 Play N Trade video game retail locations worldwide. Our diverse product lineup includes new and used video games, accessories and consoles from leading manufacturers. We are known for carrying everything from cool retro gaming products, such as the original Nintendo, to the latest state of the art systems such as the Xbox 360. Additionally, our stores offer repair services and diagnostics. Our goal is to be the gamer's ultimate destination. Our stores don't only look different, they are different! We pride ourselves in being experts in the gaming industry. After all, the Play N Trade concept was conceived by gamers for gamers. Using "experience retailing" strategies, our stores capture the excitement of this growing industry by combining interactivity and fun into the foundation of the brand. 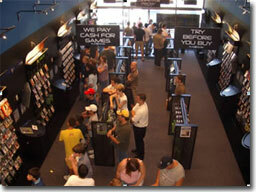 We define "the ultimate gaming experience" by delivering uncommon customer service and interactivity. Distinct competitive advantages are achieved by giving you access to expert guidance, world-class training, national brand recognition, operational support, and cutting-edge technology. Our stores come to life by realizing an innovative retailing vision with broad appeal. We cultivate your success as a Play N Trade franchisee by providing you access to a wealth of resources. Our only mission is to help make your store be profitable from the moment you open your doors. In addition to our traditional franchising opportunities, we also offer an Area Developer Program. Area Developers can develop Play N Trade franchises within a specific geographic territory with a moderate investment. Although gaming has become ubiquitous in our culture, industry analysts agree, this is only the beginning. Play N Trade is a market leading video game retailer offering consumers the latest in new video games, gaming consoles, trading previously owned games/consoles, and on-site repair. Play N Trade's customer-centric approach has built incredible customer loyalty. This philosophy, combined with in-store tournaments, a no pressure "try before you buy" policy, and knowledgeable staff give our stores credibility within their community. Play N Trade is committed to assisting all of our franchisees in building their own thriving businesses. If you are looking for an incredible business opportunity with high profit potential, Play N Trade will exceed your expectations. Contact us today!